HUAWEI’s Unlocked Mate 10 Pro is the company’s latest and most innovative flagship smartphone to date. It has an excellent and nearly bezeless screen with two optically stabilized cameras, that are co-engineered by Leica. Its octa-core AI enabled Kirin 970 CPU and NPU neural-network processing unit intelligently analyzes what it sees and adjusts camera settings automatically. A sealed 4,000 mAh battery runs apps for up to a full day and a half. 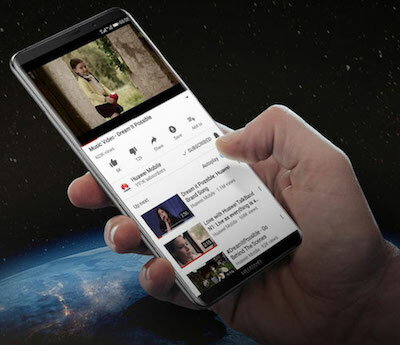 The HUAWEI Android smartphone comes with a vibrant 6” FullView HD 18:9 AMOLED display. The Mate 10 Pro’s curved glass with aluminum body, immediately makes it feel like a solid, premium device. It is one of the first smartphones with AI and an NPU. My speed tests around the Western US were fantastic and in real world usability scenarios, it streamed video and accessed the web on AT&T’s nationwide advanced LTE wireless network without buffering. Disclosure: I am an International Huawei Key Opinion Leader and AT&T Wireless Brand Advocate Ambassador. I received a HUAWEI Mate 10 Pro at no cost. I have not received compensation for this lifestyle overview. All thoughts and opinions are my own. Photos are courtesy of Huawei unless otherwise noted. HUAWEI’s MATE 10 PRO came pre-loaded with Nougat 8 and it updated to the latest Google’s Android security patch in February. Updates are important and Huawei is consistent with releasing them, as I have observed over the last year and a half. The unlocked MATE 10 PRO comes with the ability to access various GSM networks around the world. I used AT&T’s advanced 4G LTE wireless cellular network with this smartphone. It performed without a single app crash or delay while completing all of my normal social media tasks, surfing the web, streaming videos, creating videos, and multitasking with multiple apps. Then, I started evaluating its photography capabilities that are co-engineered with Leica. The cameras, AI and imaging software are certainly technically beyond anything my iPhone 6S Plus can do. Barely there bezels on the top and bottom allow for a 18:9 screen and body ratio while still including a 8MP forward-facing camera. Its new Leica dual-camera can record 4k video, its AI system creates an incredible bokeh effect, and it has real-time recognition of what is in front of the lenses, sensing people, food and more in the viewfinder. Taking photos and recording video was quick and easy with the help of its octa-core Kirin 970 CPU. The artificial intelligence recognition system was incredibly fast at automatically adjusting its camera settings. The screen’s 70,000 contrast ratio with 112% color saturation made photos pop. The layout for the various photography modes are nearly identical to those found in the previous camera app versions. Tap and hold on the screen to lock in focus, and still be able to adjust white balance. The monochrome sensor is 20MP and its RGB sensor is 12MP. Combined, the Mate 10 Pro creates incredibly rich photos with ample contrast. 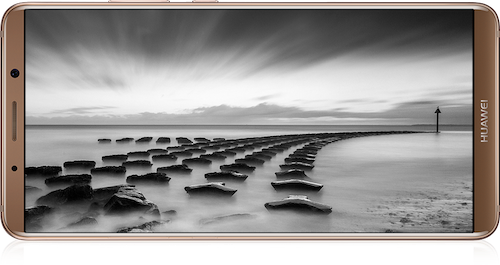 Huawei and Leica go a long way to help create some of the best monochrome photos from a smartphone that I have seen. Typically, monochrome photos from a smartphone are created by removing color. Taking selfies with its 8MP camera on the front are great for sharing on social media. Curiously, Huawei has yet to crack an automatic HDR photo mode. Huawei’s Mate 10 Pro includes 4×4 MIMO antennas to maximize 4G LTE and Wi-Fi signal strength. The thin metal body fits a huge 4,000 mAh battery, a USB-C port with SuperCharge support, and a very nice OLED screen. The phone offers IP67 water resistance and an RFID sensor for wireless payments. That will be useful with the newly announced Google Pay. Its screen and body were protected throughout testing. Huawei’s kit includes a pre-installed screen protector and a flexible case. The plastic screen cover did not show any scratches through testing and the case was a nice bonus. The right edge is where its volume rocker and power buttons are located. 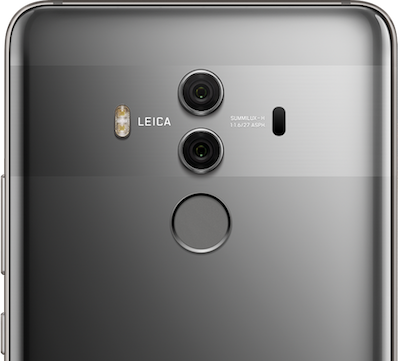 The fingerprint scanner is on the back, in the middle, beneath the dual cameras. Thankfully, the Mate 10 Pro’s SuperCharge enabled USB-C charging port is in the middle of the bottom. A combination tray houses both a nano SIM and microSD card. An octa-core Kirin 970 CPU drives the Huawei Mate 10 Pro with 6GB of RAM and 128GB of storage. Other models are offered with different storage amounts. That 128GB of storage will fill up quickly when recording 4k videos and snapping thousands of full resolution photos. Its micro SD card slot can expand storage up to an extra 256GB. I like using Kingston’s 128GB micro SD compatible with speeds required for recording 4k video. The Huawei Mate 10 Pro comes with a SuperCharging wall adapter and a USB-C cable. 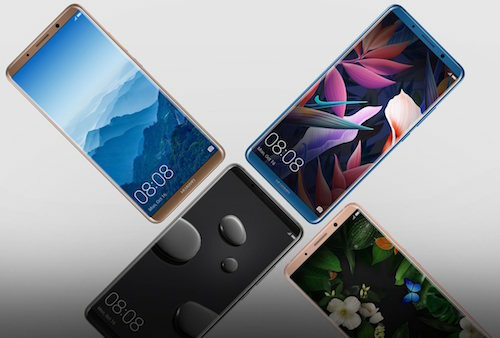 Because this Android smartphone comes with Huawei’s latest SuperCharging technology, it only takes about 20 minutes to bring its battery back to about eight hours of power. Pro tip, any smartphone can be charged faster via a wired adapter, if it is powered off. Huawei’s Mate 10 Pro ships with Android Oreo 8 firmware and has received the January, 2018 update. Hopefully Huawei will eventually send out the next Android firmware when its ready from Google. As previously mentioned, the Huawei Mate 10 Pro comes with access to AT&T’s advanced 4G LTE network. I completed multiple speed tests on the west coast, that included Las Vegas, Los Angeles, Sacramento, and Salt Lake City. Those tests resulted in speed ranges from 52Mbps to 73Mbps for download and at around 16Mbps for upload, on the higher end of the results. The speeds tests were completed with speedtest.net. The exciting news from AT&T is that 5G will be coming soon and one of their first cities to be deployed in will be Sacramento. The resulting 4G LTE speeds once that goes live should increase as the backhaul to the cell sites will be dramatically increased. Call quality was good in multiple environments as it enabled VoLTE or HD Voice. The Mate 10 Pro comes with noise suppression technology to help in more challenging calling scenarios. To connect to various data networks, it comes with dual-band 2.4GHz and 5GHz a/b/g/n/ac Wi-Fi and Bluetooth 4.2 LE wireless technology. Its 4×4 MIMO antennas and Gigabit rated modem, are future ready for when GSM cellular providers upgrade their sites. Huawei has come a long way from their P9 and Mate 8 from only two years ago. Their Mate 10 Pro is a true flagship from one of the world’s top smartphone manufacturers. Multiple online sites carry Huawei’s Mate 10 Pro with 128GB of storage and 6GB of RAM, including Best Buy. For an unlocked flagship phone, their price of $799, is several hundreds less than the S8 Plus or iPhone X. This means that you can purchase the phone and immediately use it with your current provider, by swapping in a nano SIM card. Its huge 4,000 mAh battery and OLED screen allowed me to use the phone for nearly a day and a half before needing a charge. When on Wi-Fi only, I moderately ran the Mate 10 Pro for nearly four days. An 8MP camera on the front produced great selfies. The screen bezel is so thin, a forward facing flash on the front was not included. Recording videos and taking beautiful photos was a snap, its shutter speed is on par with Samsung’s latest Galaxy smartphone. Huawei’s inclusion of SuperCharge was key to top up the battery whenever I needed extra juice. The Android Oreo 8 experience with EMUI 8 was fine and Huawei frequently works with Google to deploy security patches. Dual Leica cameras and a professional mode let me tap into my photography skills. Huawei’s Mate 10 Pro AI recently autonomously drove a car and avoided an animal in the road. Can your smartphone drive a car?